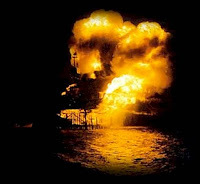 In 1988 the most ghastly accident occurred on the Piper Alpha platform in the North Sea, killing 167 men. The cost of the commodities we consume so enthusiastically is not measured in $ alone. The Cullen Inquiry that followed did an excellent job in identifying the measures required to prevent the recurrence of such an event. Its recommendations were accepted worldwide: on the engineering side this primarily involved the installation (and retro-fitting) of non-return valves to protect any manned platform from the possibility of fire being transferred along a pipeline. This approach works the trick and it is just lamentable that so often it takes a tragedy to move us forward. But, uncomfortable though it may be to acknowledge, that is the way of the world. 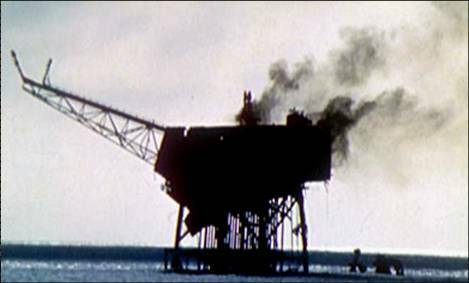 One immediate outcome of Cullen was that the material cost of offshore oil & gas activity looked set to soar, and it was widely assumed that the industry would decline: new manned offshore platforms would, it seemed, rarely be economic. However, after a brief hia tus it was realized that if unmanned platforms could be made to work, new developments might once more be viable. The technology was just around the corner and, with a couple of other engineering breakthroughs a new generation of developments were based around small, unmanned, 'single-lift' platforms that could be prefabricated onshore. Paradoxically, the costs of development thereby fell significantly, giving a massive boost to an industry that was reeling from the disaster, and permitting the safe extraction of far greater reserves of oil & gas than had seemed possible. It may seem heartless to recount such a story at this time. But when thinking through the consequences of Fukushima, as I am sure we all are, it's worth having a full perspective, including the counter-intuitive possibilities. It's the way of the world. The disaster in Japan might result in getting some much needed R&D money going into fusion energy. Ever hopeful. And as you say it is sad that sometimes it takes a tragedy to move technology forward. I didn't think C@W would be buying this nonsense. SumoKing, I normally very much like Lewis Page's The Register articles, and they give much insight. But he has forgotten one very important fact. These reactors have a Spent Fuel Pond on the roof of the reactors, which contains about as much fuel as in the thick-steel reactor pressure fuel - usually the previous fuel load in its first year of cooling. So when the rooftop region explodes, at best pool cooling is lost, more likely water no longer covers it, at worst the explosion blasts this pond spent nuclear fuel all over the site. Looks like explosion 3 may have done the worst, possibly the second as well. His claim "The three worst affected will cost more to put right than the other ones" will haunt him. Clearly ridiculous that these three will ever run again. And the rest of his analysis will turn out significantly mistaken. We can only hope / pray for the bestand that the Japanses efforts work. My understanding was that the spent fuel ponds at fukushima are pretty much adjacent to the reactor rather than above and in the roof sections damaged and that looking at the damage pics unlikely to have been blasted about. I'm not a nuke engineer though so I bow to your reactor construction knowledge. I think the main point stands, the nuke plants are about the only things not to have killed people following the earthquake tsunami and yet the media is in meltdown (could not help myself sorry) over this. Everyone thinks another chernobyl (56 dead) is on the way and nuclear devastation is around the corner because an old plant worked well. at the high risk of being facile, in Japan wind farms would be on the mountains and so would probably survive! I am crossing my fingers all works out, but 3 reactors out of control in Fukushima is a very dangerous situation to be in - certainly not irrecoverable, but not good at all. Oil storage blowing up does not compare to possible irradiation of large tracts of land, sea and people - it is a poor comparison. I'd agree that the deaths of tens of thousand from water puts the reactor issue into proper perspective. But within the limited domain of the nuclear world, this will remind policymakers and economists that they need to price the downside of nuclear properly. The risk-cost of many tens of km^2 of prime land being uninhabitable for 10+ years is enormous. With nuclear being at best considered marginally economic before, this will be a real killer. On the roof top accessible spent fuel ponds, take a look at this image. The reactor spent fuel pond is under the roof gantry crane. I think it normally holds the previous fuel load until nearly the next refuelling (~18 months), probably so it is cooler when moving out to the big shared pond. I was discussing peak oil and lamenting the lack of action by policy makers to a colleague at work. His thoughts were he doubted much would happen until shortages kicked in. And perhaps that is what is needed, a sustained energy crisis. I think there is a sizeable middle ground of the electorate who have no major knowledge of the subjects at hand and have just gone with the flow about climate change/co2/nukes. But if we have a major energy crisis (and I think the UK is heading in that direction) the whole "co2/nuke is evil" argument becomes an increasing difficult subject to sell to the electorate. ND has on many occasions made a excellent point, and to put it another way. If its mid winter and people are having to put 10 layers of clothes on to keep warm and their cat has frost bite, what are the electorate going to want? green energy or warmth? The BBC, Guardian etc green propaganda has become almost religious in its fervour, if we had an energy crisis I could see there being a green backlash.